Simply, the working conditions were terrible during the Industrial Revolution. As factories were being built, businesses were in need of workers. With a long line of people willing to work, employers could set wages as low as they wanted because people were willing to do work as long as they got paid. People worked fourteen to sixteen hours a day for six days a week. However, the majority were unskilled workers, who only received about $8-$10 dollars a week, working at approximately 10 cents an hour. Skilled workers earned a little more, but not significantly more. Women received one-third or sometimes one-half the pay that men received. Children received even less. Owners, who were only concerned with making a profit, were satisfied because labor costed less. Factories were not the best places to work. The only light present was the sunlight that came through the windows. Machines spit out smoke and in some factories, workers came out covered in black soot by the end of the day. There were a plethora of machines with not many safety precautions. This resulted in many accidents. The workers only received a break for lunch and a break for dinner. Children were paid less than 10 cents an hour for fourteen hour days of work. They were used for simpler, unskilled jobs. Many children had physical deformities because of the lack of exercise and sunlight. The use of children as labor for such long hours with little pay led to the formation of labor unions. Labor Unions formed because workers finally wanted to put a stop to long hours with little pay. They demanded more pay and fairer treatment. They did not want children to work in factories because of the danger involved. 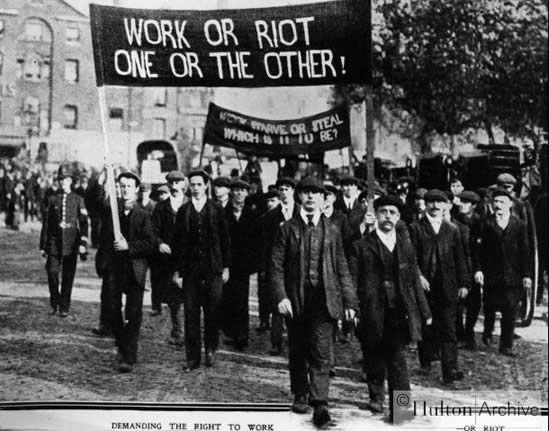 Labor unions organized strikes and protests. However, as more immigrants came to the United States, more workers became available. These workers were willing to work, even if others were not because of unfair treatment. This lessened the effect of the labor unions since businesses had no shortage of workers. This is why most labor unions were unsuccessful. As business began to boom and the national markets grew, more people began to move to the Northeast because they wanted jobs. 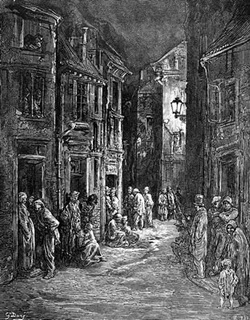 Most people lived in the "slum" as depicted in the picture to the left. Five to nine people lived in a single room which was as big as an apartment. Not only was there not enough room, but more people got sick as well. Because everyone lived in terrible conditions and so close to one another, diseases spread rapidly and lack of medicine and medical care resulted in many deaths. At the time, population was increasing rapidly because of more people moving in, so apartments became more crowded and in worse condition. These were the people that lived every lives that had to fight for jobs and competed to live. As industrialization occurred, the middle class emerged. The middle class, skilled workers, managers, clerks, accountants, and others, had the money they needed to survive, and had money left over for other leisure goods. This extra money enabled them to live comfortably. Most moved away from the cities because they thought the "slum" was unhygienic and unpleasant. This led to the beginning of suburbs, or socially segregated neighborhoods. However, the majority of the people living in industrialized areas lived in terrible, harsh conditions because of the lack of money and the overwhelming population.